Strawberries are the star of my latest creation: Strawberry, Jicama and Lime Guacamole. This guac combines bright colors, multiple textures and flavors! I’m a huge fan of anything guac, and love this twist on the traditional mix of mashed avocado, garlic, onion and lime juice. When Stephanie, a producer at KSL Studio5 asked me to participate in their “Gauc Off” this week, I was up to the challenge of creating something outside the box! The rest of the ingredients in this Strawberry, Jicama and Lime Guacamole are avocado, lime, jalapeño, fresh cilantro and a little salt and pepper. I added a little avocado and lime drizzle to dress up the guac, (fun, but not necessary). If you make the drizzle, my favorite tool for blending sauces and dressings is this Immersion Blender, it’s one of my most often used small kitchen appliances. Kick off the season by hosting your own Guac-Off this summer! Combine all of the guacamole ingredients in a medium size bowl, fold together. 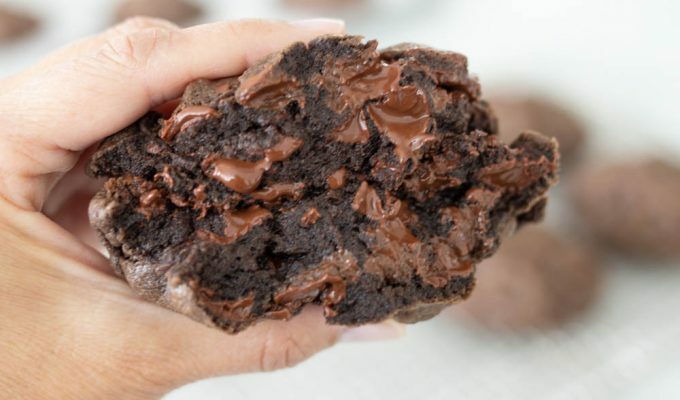 In a bowl or jar, combine the drizzle ingredients and pulse with immersion blender until smooth. Spoon the ingredients into a small ziplock sandwich bag, snip off end and drizzle on top of guac just before serving. If making ahead, store guac drizzle in refrigerator until ready to serve. 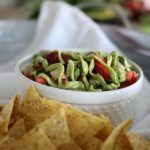 When ready to serve, place strawberry guacamole in a bowl, carefully squeeze the drizzle ingredients on top of the guac. Serve immediately! -Use food handlers gloves while chopping jalapeño. If you want the guac to be kid friendly, remove the seeds. The seeds will add heat. -Fold the guac ingredients together to avoid smashing the avocado. For guac that includes fruit and several different colors of ingredients, such as this guac, folding instead of mashing the ingredients produces a more colorful end product. If the ingredients are mashed together, the colors blend and produce a less pleasing to the eye dish!